Welcome to To Make You Smile! We hope you enjoy our art. 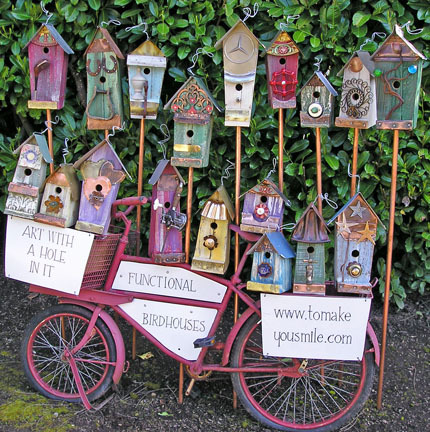 We sell it only at shows as each piece is unique and handmade and our birdhouses are built to Audubon specifications. We've finished our shows for 2018. We'll be busy this winter jurying for shows and making an abundance of new art. Thank you to everyone who came to the shows -- hope we made you smile! Please join our emailing list if you'd like to hear about our upcoming shows in the Pacific Northwest, or click here to contact us. As birds gather from nature, we gather from the urban backyard to create their houses. We use objects that have ceased to serve their original purpose, but offer unique visual and textural qualities when used out of their original context in a second, more provocative life. Our houses provide a functional and affordable home for cavity nesting birds. Our work is a tribute to my Grandfather, who while the snow was on his fields, created a legacy of beautiful and functional objects from society’s discards. Our goal is to provoke, in a way to arouse, a variety of different positive emotions from people often attributable to their past experiences or memories. When you look out into your garden, even when your flowers are sleeping, and find yourself smiling, our work has been a success.